Wow, it's been quiet on the Daddy Types front. Too quiet. But there is no better topic to end the site's 12th year [!] on than Disney Princesses. 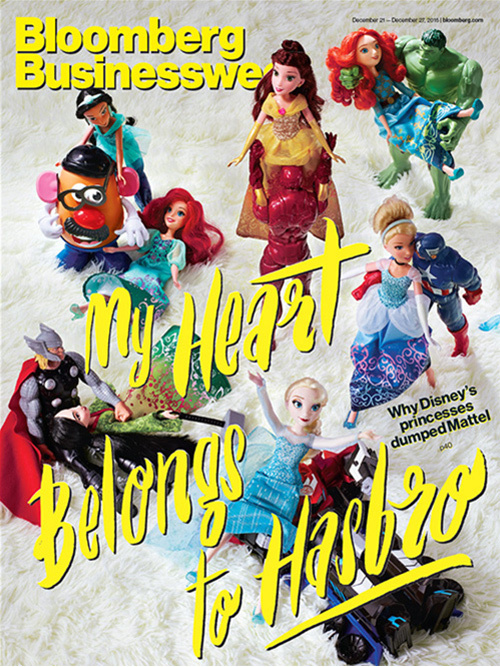 Or specifically, the play-by-play Business Week story of Mattel's bungling of the Disney Princess license, the foolish encroachment by the flailing sexist Barbie menace, and the redesign & reboot by the new licensee, Hasbro, which also produces Marvel and Star Wars toys. As you can imagine, there are no winners here, there is no silver lining, no happy ending. A bunch of stupid toy executives blew it and got fired, and the Disney Princess crap they've been shoveling into Toys R Us for the last few years is getting replaced with slightly more action-y, redesigned Disney Princess crap in vaster quantities. In 2013, Disney set up a meeting with Hasbro, which already had Disney's Star Wars and Marvel licenses, and its FunLab ran regular tests for the company. Before each Star Wars movie, for example, Hasbro tested kids' familiarity with the franchise. They discovered that parents--"dads mostly," says Frascotti--passed down their love of Star Wars to their kids in the same way that they taught them which sports teams to root for. "We have a fancy term for it that we made up," says Frascotti. "We call it trans-generational emotional resonance." Disney liked Hasbro's FunLab reports. "They'd seen them work quite well for Star Wars and Marvel," says Goldner. "Then they asked us what we knew about girls." That girls don't buy into the princess paradigm is what. But don't worry, Disney's got a bunch of workarounds to keep the money flowing until we find out what Rey's story is.